Once upon a time, Shoyo Hinata saw the legendary haikyu (volleyball) player known as “the Little Giant” compete at the national volleyball finals. Since then, Shoyo has been aiming to be the best volleyball player ever. However, in a sport in which tall athletes dominate, Hinata's height of 5'4” is considered too short. Still, he does not believe that a player needs to be tall in order to play volleyball, especially when a player can jump higher than anyone else – as he can. As Haikyu! !, Vol. 5 (entitled Inter-High; Chapters 35 to 44) opens, the competition brackets are revealed. It is time for the Miyagi Prefecture volleyball qualifier rounds of the Japanese National High School Sports Tournament, better known as “Inter-High.” Hinata's Karasuno Public High School (the “Crows”) have drawn Tokonami High School. Even if they get past Tokonami, Karasuno must face Date Technical High School and their “Iron Wall” of blockers. It was not long ago that Date Tech easily handled Karasuno. THE LOWDOWN: The Haikyu!! manga may draw comparisons to Tite Kubo's legendary basketball manga, Slam Dunk. With each volume, however, Haikyu!! pulls away from such comparisons. Haikyu!! 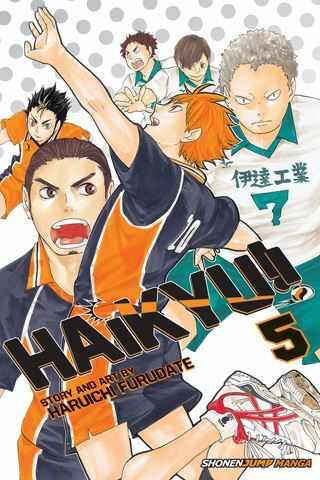 Volume 5 takes the readers into the first volleyball matches for Karasuno that actually count, unlike the practice games depicted in earlier volumes. I must admit that Haikyu!! 's volleyball matches are not as exciting as Slam Dunk's basketball games, but Karasuno High is such an underdog that they are always on the edge of oblivion, which makes for exciting reading. What more can a sport manga reader expect?